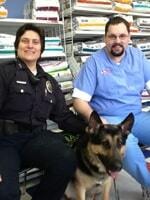 The Arbor Ridge Pet Clinic is proud to sponsor and provide pro-bono care for one of Madison areas canine units. Officer Josh together with Officer Teresa McKenzie are part of the Madison Police Forces K9 Unit. Josh's job is to assist in finding missing or lost people, finding and recovering illegal drugs, and apprehending criminals who are resisting arrest. Dr. Shawn Hook and the Arbor Ridge Pet Clinic was approached in 2011 to help sponsor one of the K9 units in the Madison Police force. Dr. Hook and the Arbor Ridge Pet Clinic are honored to provide care for one of Madison's K9 Officers who give so much to ensure our safety.